Then Detect them with motion lighting and detectors. Cameras with motion detection turned on, and even alarm motion detectors. Delay them by presenting them with hardened entry points that are not a pushover. Criminals don’t like the idea of having to work too hard to gain access. Really good locks and steel doors go a long way into changing their minds. If it looks like a daunting task, criminals will decide to move on down the road and look for an easier target. Deter, Detect & Deny. 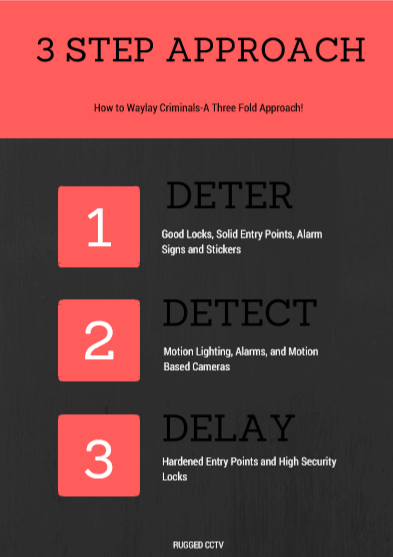 A solid 3 step approach to make criminals look elsewhere. This entry was posted in Protect Your Business from Crime and tagged business security, protect your business.